Today is the day â€” â€˜Life In The Cityâ€™ has arrived! We are so excited and proud to share this album with the world! ðŸŒŽ THANK YOU all for the continued support. CLICK HERE to buy an LP, CD, or download/stream on your favorite app. Give it a listen, let us know what you think, spread it around, and weâ€™ll see you soon on the road! Credible bios are supposed to be objective and not full of superlatives and hyperbole, but itâ€™s hard to avoid gushing when the subject is a funk army of multi-instrumentals and singers that is part freight train and part tyrannosaurus rex, whoâ€”even on an off nightâ€”can blow away a room on the basis of sheer physics alone. Thatâ€™s one way to describe Turkuaz, but it doesnâ€™t address the music. In this regard, as with any band, influences are everything. One cannot escape them as one seeks to carve out a unique sound for themselves. Still, there are so many benefits to having Sly & The Family Stone, Rick James, Parliament and Bohannon in your record collection. 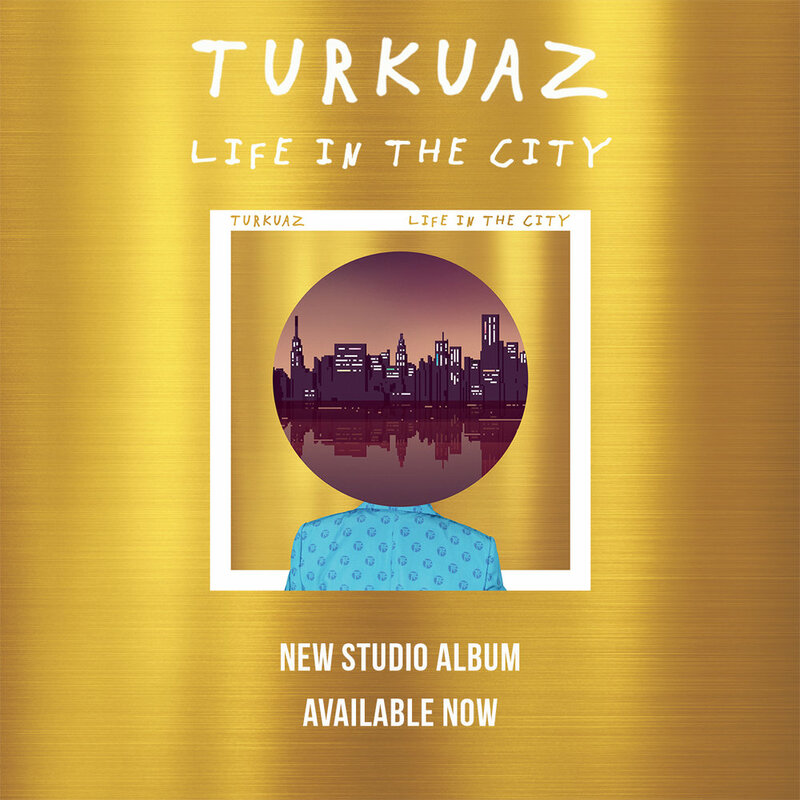 With this as the basis for a recipe, Turkuaz adds healthy doses of jittery, world-pop-power grooveâ€”reminiscent of Remain In Light era Talking Headsâ€”and a passion for Motown and R&B, resulting in a refreshing twist on the funk idiom. Turkuaz certainly does have sheer size in their favor, but when broken down into the basic components, each stands out on their own. Founders Dave Brandwein and Taylor Shell had the cream of the crop to choose from at Berklee, but making it happen as a large touring ensemble takes more than chops: it takes the right blend of personalities. When Turkuaz takes the stage, the chemistry is clear. The special combination of elementsâ€”singers in sequined dresses, guys in tails (or sometimes all of them in jumpsuits or other complimentary outfits) horns, keys, guitars, amps and drums and smiles all aroundâ€¦ well, itâ€™s easy to get caught up in the explosive auditory and visual circus and find oneself dancing. Despite all of the gear and people on stage, it becomes clear that it is not the size that matters here: it is the performance.